See also the mp3 page. Loud and straight to the point! Classic diesel sounds that will get your furniture on the move! Recorded during 1983 to 2011. 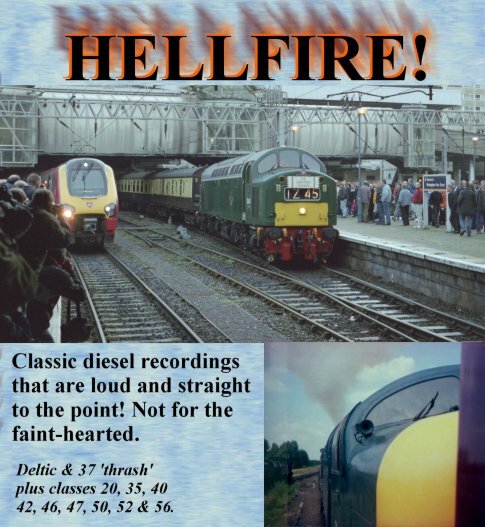 The loudest highlights taken from my other diesel CDs (plus a few from my "Engines On Audio" title). Deltics and 37s predominate, but classes 20, 35, 40, 42, 46, 47, 50, 52 and 56 also feature. ***55022/50049 double-heading on the ECML, both on full power! 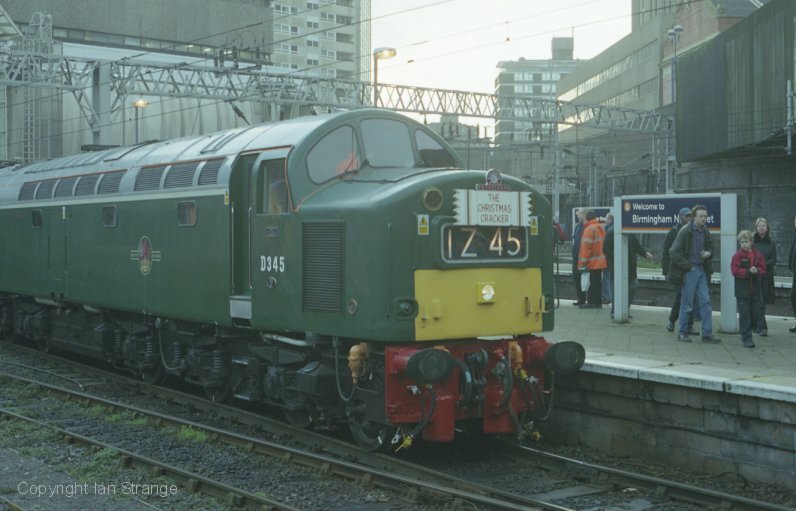 ***D345 (40145) launches its debut tour out of Birmingham New Street. NOTE: All recordings on this CD also feature on other CDs in my range. 47829 departs Birmingham New Street. 1 - D345’s main line return on a railtour to Holyhead, "The Christmas Cracker". It launches its train out of Birmingham New Street (30th November 2002). 2 - 37401 raises the roof as it departs for Holyhead from Crewe. (12th December 1998). 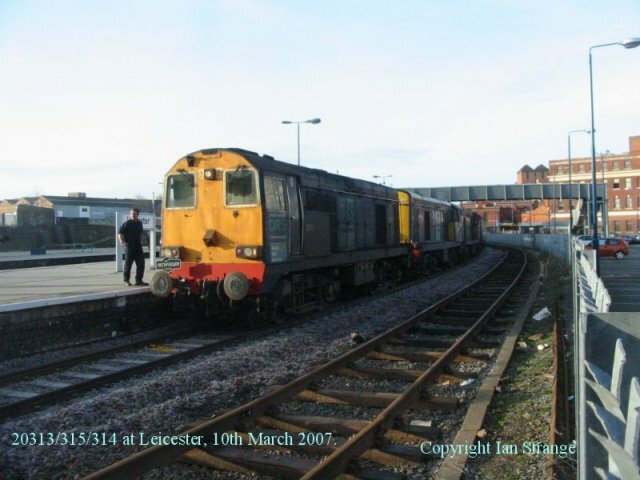 3 - A triple header class 20, nos.20313/315/314 depart Leicester on an enthusiast railtour (10th March 2007). 4 - *37401 departs for Holyhead at 1423. Apparent brake trouble on the old mark 2a coaches brings us to a halt just inside the tunnel. The 37 has a brief tug-of-war with the train brakes before making a rousing standing start through the long tunnel (12th December 1998). 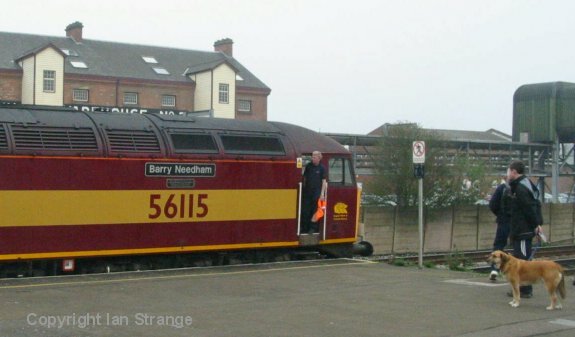 5 - a) A farewell railtour for the class 56s sees 56115 arriving at Burton-on-Trent station. - b) 56115 then departs at 8.48am. The generator coach can be heard at the rear of the train supplying on-train power (31st March 2004). 6 - It is raining lightly at Summerseat. 47306 gets wheel-slip as it departs uphill. The rear wheel-set can be heard sliding. (11th September 1999). 7 - *37906 pulls away from Summerseat and demonstrates what Britain's loudest loco sounds like in a tunnel, shooting flames from its exhaust! 8 - D1041 makes a rapid standing start from Bury at 1805. (8th June 1996). 9 - *Hymek/Warship double-header D7076/832 accelerate rapidly away from Loughborough Central at 1646 (the loco crews sporting Thunderbirds hats!). 30th March 1996. 10 - *9019 makes a quick start from Quorn, north at 1506. (20th July 1991). 11 - Some road traffic is heard on the bridge at Quorn, as Deltic D9019 returning north, passes through the station and erupts from under the bridge. (21st May 1995). 14 - *D9000 departs Euston at 1145 with a 13 coach train. Then signals slow progress - the gradient almost bringing the train to a halt short of a red signal. “Royal Scots Grey” heaves the train forwards, the signal changes to yellow, and once over the summit coasts until the next signal is sighted at green. The Deltic then accelerates through the tunnels. "The Cross Country Deltic" railtour (13th April 1997). 15 - Birmingham New Street. After uncoupling, D9000 moves a few feet, stops, then nearly over-loads the recording equipment blasting down to the platform end. The Deltic pauses to pick up one of the assistant engineers and then moves off swiftly, and photographers walk back up the platform. (1st August 1998). 16 - Birmingham New Street. 47829 belches out smoke under the footbridge, and eventually moves away swiftly after much revving, from the west end of the station. (1st July 2000). 17 - *55002 departs Summerseat, opens up in the tunnel, and gets some wheel-slip. 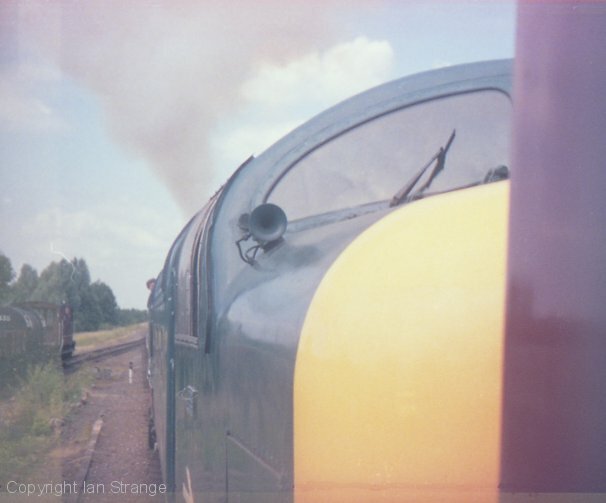 ELR "Traction Day" (9th July 1997). 18 - *In the driving cab of Deltic D9000 at Coventry on one of the 1998 Ramsgate-Birmingham service trains for Virgin. With only 7 minutes left to do the 10 miles to the next stop at Birmingham International, driver Mark Sommers gets our train under way pretty swiftly. The driver induces a field-divert manually by easing off slightly. 19 - a) 50031/049 roll into Leicester on an excursion to Alton. - b) 50031/049 make a hasty departure (4th October 2004). 20 - *Heard from the rear driver's seat of D9000 on a Virgin service train. With the side windows open to let in more sound, Alan Bun-Clark makes a storming departure from Birmingham International heading back into Birmingham. The ammeter surges passed 2300 amps (overload would be at 2400), leaving an anxious looking engineer Chris Wayman chewing on his gloves! 0 to 60 mph is achieved in 108 seconds. Alan induces the field-diverts manually by easing off slightly at 42 and 65mph. (7th August 1999). 21 - Purple Deltic 9016 on its first railtour after returning to the main line. Back at Crewe at 2310hrs as a class 37 stands in the background, 9016 propels the ECS out of platform 12 (6th April 2002). 22 - 37425's engine is hunting badly, as it idles and then sets off from platform 3 for Holyhead at 1007 hours (heard from under the road bridge). Birmingham New Street (1st July 2000). 23 - 37412, parked under the road bridge, blasts out from platform 12 on a Holyhead working at 0917. Crewe (20th May 2000). 24 - Loadhaul liveried 56118/107 storm the Lickey Incline at 1938hrs on a railtour. (2nd August 2003). 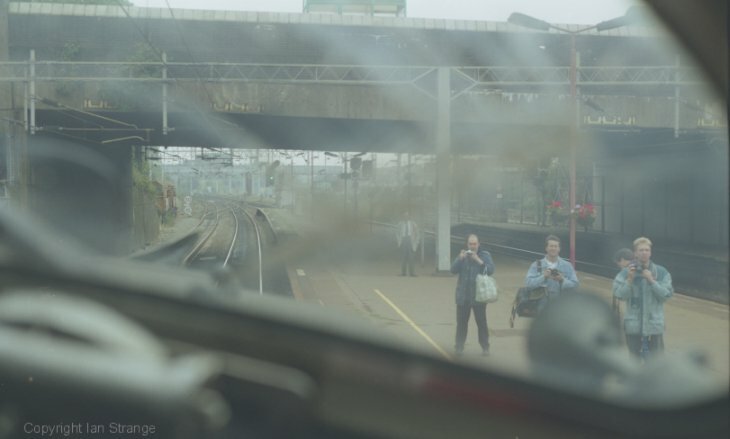 25 - *D9000 departs Ipswich, and driver Nigel Hutchison gives us a great blast inside the tunnel, as the revs of the trailing power unit rise and fall. An Anglia Railways service train. 11th August 2002. Apologies for the slight overload distortion. 27 - The “Autumn Highlander” railtour is heard heading back to London at dusk. 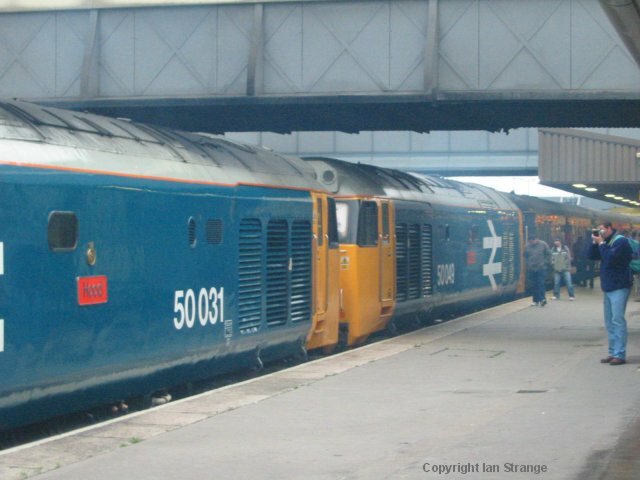 Deltic 55022 double-heads with 50049. The deep throbbing of the 50’s V16 engine contrasts with the high revving drone of the Deltic’s twin Napier engines. 40145 is dead at the rear of the train. The location is Holme Fen, a few miles south of Peterborough. (8th October 2007). SOTA: State-of-the-art recording equipment was used. PMONO: Processed mono archive recording with pseudo-stereo effect.